These Medium Density Polyethylene tanks are rotationally molded into a number of standard sizes. After you select what size tank is needed for the spacial specifications of your project we are able to customize the type and placement of the fittings in your tank. This way, even standard size tanks can be customized to easily fit in the space available. The tanks can also be provided with their standard fittings. 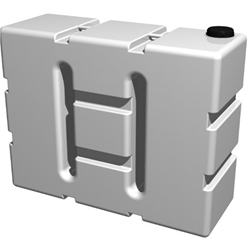 These tanks come complete with either ¾" (only 250 litre models) or 1" outlet at the bottom for connection to a tap or hose and an 8" vented cap. Other fittings can be supplied upon request (available separately). *A comprehensive range of different diameter fittings available to order.